The KHL, international league led by Russian hockey professionals, has passed its quarter-season mark this October. The league enjoys intrigue, good hockey but does suffer from financial instability of clubs. The game is flourishing in the league as it attracts more and more talent, audiences and clubs. Speaking about the intrigue in the league, this does exist and it leads audiences to arenas. However, at the point when the first quarter of the regular season is over, the main intrigue is whether any club in the KHL will be able to effectively compete against the championships’ leader ‒ SKA St.Petersburg. And then, if anybody can prevent SKA from winning the much coveted Gagarin Cup. This month it is the game of SKA (St.Petersburg) vs CSKA (Moscow), which has attracted the attention of most of the fans and media analytics. The game, which took place in St. Petersburg on October, 16, was a hilarious drama with many hints into the future of the regular season and afterwards. The result of the SKA vs. CSKA game was not settled until the last period of the game and this made the event more savory than expected. Ilya Kovalchuk and Alexandr Radulov starred through the whole of the game: they scored, fought, celebrated and actually dueled each other during the three periods. In the end it was Kovalchuk and Co. from St. Petersburg who won 4:3, but among the winners were also all the fans on the arena and TV-fans watching the game. The first goal of the game went into the net of SKA just 39 seconds after the game started. Grigorenko scored after a passing series by Da Costa and Radulov. Thus, CSKA showed it was set to continue its series of 13 uninterrupted victories in front of the packed rival arena. The game attracted 12327 fans to watch it live on the arena. The ensuing no-goal battling lasted for the thirteen consecutive minutes and during the fourteenth minute of the game SKA evened the score: Andrey Kuteikin scored in power-play after a pass by Kovalchuk. No more goals were scored in Period 1, but many more interesting things happened. Alexandr Radulov was the centre of attention after that goal and well past the final whistle of the game. While showing his total dissatisfaction with the quality of the referees Alex first got 2 minutes on the bench for misbehaving, which then went up to 10 for violent behavior. Second period brought four more goals and tied the result. Four and a half minutes into the period Radulov started an attack and then scored a back-hander for CSKA assisted by Da Costa and Denis Denisov. A minute later Denisov and Radulov changed favors. While in power-play Denisov used his slap-shot to finish a classical CSKA combination and to put his team firmly in the lead – 3:1 for CSKA. These two goals by Muscovites sobered the St. Petersburg team and made their leader Ilya Kovalchuk especially concentrated. 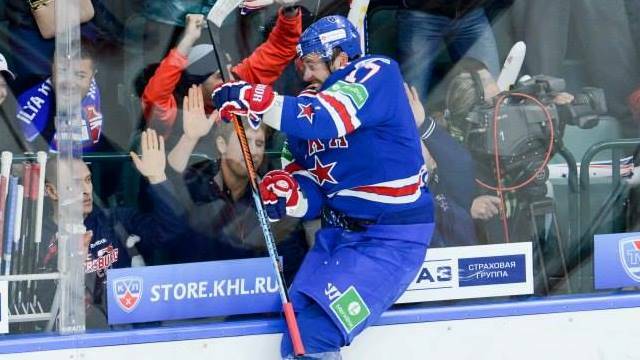 Until the end of the period Ilya scored twice and evened the score. He shot two goals in power play: one in the middle and one in the end of the period. In between he had a good chance to score in a one-on-one with a goalie but was illegally stopped and during the penalty shot could not outperform CSKA’s goalie Stanislav Galimov. Artemiy Panarin scored the final goal of the game using his skills and the sense of the game. He found a hole between two CSKA defensemen in front of their blue line. Once with the puck passed by Aleksandr Kadeikin, Panarin went straight to the net past clueless defensemen and scored while falling onto his knees. This was the final goal of the terrific match. 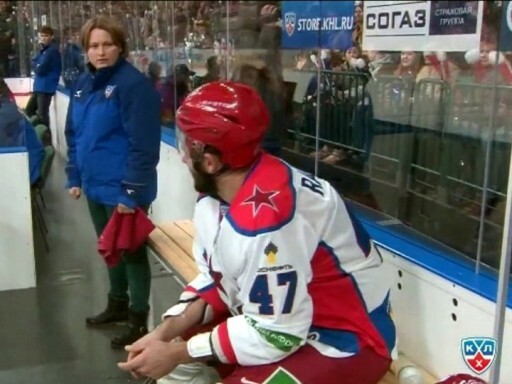 After the game Radulov received the best player award, gave it to the referee and then got another 20 minutes’ penalty. After that Big Alex decided to kick the door of the referee room with his skated foot on his way to the dressing room. This game between two leaders of the regular season showed that SKA was stronger and CSKA could not keep a stiff upper lip while facing adversity. The following games proved this conclusion: SKA kept winning and CSKA not. Now the St. Petersburg club goes first in the tables with 60 points followed by CSKA with 54. SKA’s last game on October, 27 against Lokomotiv Yaroslavl, however, went into overtime and penalty shots, where Lokomotiv won and increased its chances of going into the finals. Currently KHL is seeing many coaches changed in the middle of the season. One of such examples is appointment of Andrey Nikolishin as Head Coach of Traktor (Chelyabinsk) instead of outgoing Karri Kivi. Chuck Weber had to leave Zagreb’s Medveščak. Both had to go due to their teams’ gradually losing chances for the play-offs. Zagreb’s team has not yet found a substitute. Whereas Traktor decided to entrust the important post to Nikolishin, experienced hockey veteran, who still has not officially ended his active playing career. Putting aside the formalities one needs to admit that during the past few years Nikolishin was invited to teams as a player to a large extent due to his tremendous hockey experience and strong leading abilities. So, the last few years were the time when Andrey could gather his fist coaching-like experience. He has admitted in his recent interview that he was preparing himself for a coaching position during five previous years through discussions with coaches and while reading on coaching, analyzing games and making notes for the future. At the moment Nikolishin leads his team and has good chances of getting play-off experience this year as a coach. Traktor’s recent game against Avangard (Omsk) was a failure, which ended in 3:0 for Avangard. This gives Traktor’s new coach a good chance to prove that he can fight as a coach as well as a player. Financial troubles of several KHL clubs make one think not only about the stability of their organisations but also about the financial stability of other clubs and the league. Salavat Yulaev (Ufa) and Sibir (Novosibirsk) are the teams rumored of having salary arrears, blocked sponsorship accounts and other financial mischief. So far, Sibir has announced that it had paid off all the arrears. The reaction of the league, the clubs and the media upon whistleblowers’ announcements is worrying. Thus, Azamat Muratov, hockey anchorman in Ufa’s BST channel, lost his job after publicly airing his concern about the club’s financial security, according to the report by Business ONLINE and his case in unluckily not unique. The negative news aside, KHL keeps hockey fans in Russia and Eastern Europe occupied with the games and intense competition and thus the league proves it can come up with a tremendous sports product and instill love for the game into the hearts of millions in Central and Eastern Europe.